"Praise the Lord, the Vision of more than 30 years has become true!" Overwhelmed, Nawal cried out with eyes welling up with tears. Many other leaders had the same response as they shared their impressions after the very blessed weekend. Everything started with early preparations in creating the programs, buying sweets and drinks and especially in searching for scriptures for this weekend. The scriptures were the most important thing for us. We wanted to ask God what He wanted to do on that weekend with us and the families. We prayed for showing His victory and rejection against the enemies which want to sever families. We gave the entire weekend into His safe hands, which led us to start the weekend in prayer. We felt His spirit surrounded us and that gave us strength and encouragement. Moreover, we sensed the Holy Spirit connects all generations with the promise that He will support and fill us with love this weekend. The best way to show people how something could work is not only to explain God’s path but give them some practical tips. The best way to show people the wishes of God for the life in a family is to be an example and to do it. By the Lord’s Grace we are God’s light for His path in the darkness. But there is another practical thing we have done as well; namely, to challenge the families. For example on Saturday afternoon, we had an exercise where the entire family had to cope with challenges to encourage them to prepare strategies to cope with problems before they come. That way they are bettered prepared to react in a positive way. While the entire family encountered challenges like having a blind dad and a deaf mum, each group had 2 members that represented motivation and joy and were there to ask the best way to cope with the problems in their daily lives. 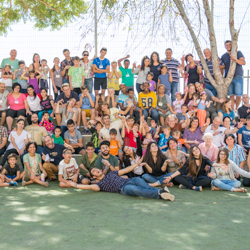 It was miraculous to see how the families grew together in this time and to observe how they enjoyed the time together. They had fun with playing games and prayed with each other as Jews and Arabs. This eye-opening experience showed us the unity which is given by Jesus, who is the Saviour of all of us. The weather was great and the children played soccer on a brilliant court. We all enjoyed slush, ice crème, pancakes and popcorn and had an amazing time meeting new brothers and sisters through Christ. The Family Team Adventure Weekend was so meaningful for our family. It helped us to see our family as a TEAM! That each of us are important pieces to the puzzle and that what God will do with a unified family will impact many lives, far beyond what we may be able to see. The location of the weekend was at a hostel in Nazareth. Our family had so much fun staying together in the same room, playing games, meeting other believers and learning from the ministry team. I would highly recommend the retreat to all families! We learned and grew so much! We can't wait until next year!